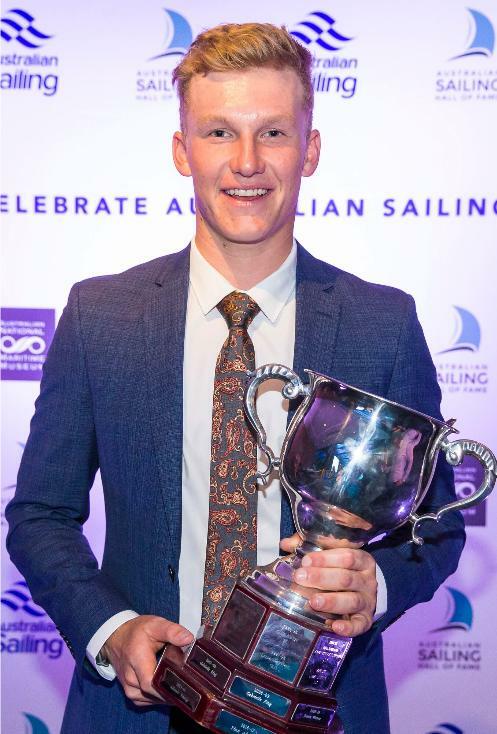 Finn Alexander, has been named Australian Sailing’s named Youth Sailor of the Year 2017 at the AS annual awards ceremony on Friday 3 November. Finn won his award as a result of his convincing performance (by a 19 point margin) in winning the Laser Class Youth World Championship in New Zealand. Since then Finn was 1st Youth (Under21) and fifth overall at the Australian Laser Championships. “I’m really stoked to pick up Youth Sailor of the Year against a really competitive bunch of young athletes,” Finn said. “For the last few years it’s been a pretty long journey for me to try to get to the top of the youths. I’m really happy to have kind of made it through that, with the help of a lot of really great coaches and mentors, my parents and friends. Finn has been sailing in Open International events through the year finishing 8th in the 100 boat fleet at the Delta Lloyd Regatta in Holland. Finn was also the only under 20 sailor to qualify for the gold fleet in the ILCA Laser World Championships earlier this year. Finn just last weekend won the NSW/ACT Laser Championship held at his home club Double Bay.